June 2011- Moab UT: Recently, we received a heart felt email from a person wishing we would never succeed in placing a cross on the moon in her lifetime. She always wanted to look at the moon and not have a visible artifact left by mankind, even if it were the Christian Cross. I understand her objection and wondered if others believed, like her that we could place something on the moon that would be seen by unaided human eyes on earth. Honestly, I would have the same feelings if for example Cocoa Cola, Nike, or Gatorade started a campaign for placing their logos on the moon to change our view of the night sky. The short answer is “no, we cannot change the moon’s appearance”. The size of our object would have to be much higher than the Egyptian pyramids. Not even a massive city sky-scraper could we see. In the Apollo program, astronauts could barely make out earth’s landmasses when standing on the moon. I recently traveled across the US at night. At 33,000 feet, I couldn’t tell if there were car lights on the roads below. However, I could see major cities because they were outlined by their multi megawatt light sources. But at 33,000 feet, small communities remain dark. If you have been to New York City, when you’re in Battery Park, you can see the Statue of Liberty. When you’re on top of the Empire State Building, you will likely need binoculars. The average distance from the center of the earth to the center of the moon is 238,857 miles but the moon follows an elliptical orbit, not circular one. The moon’s closest approach to the earth is 225,622 miles. See details at . My commercial flight across the US was only 6.25 miles above the earth. Astronauts aboard the International Space Station (ISS) orbit from 220 miles . They can see the Great Pyramids and the Wall of China. Likewise, we can see the ISS as a faint “star-like” object moving fast against the night sky. If we were to place the entire Space Station on the moon (153 feet long), it would not be visible to the human eye on earth. 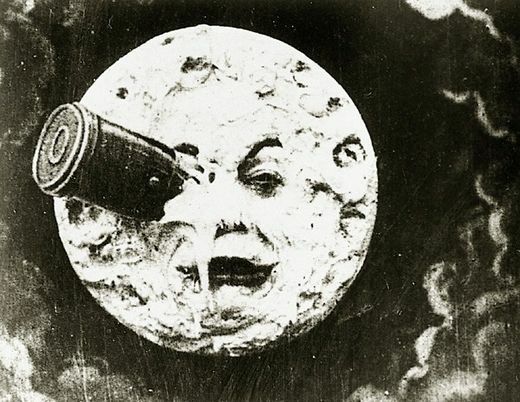 To make our inability to see objects on the moon clear, we have left many large objects there that we cannot see. These range from Lunar Landers, 8+, to 4-wheel lunar buggies that allowed astronauts to cover large distances on the moon. Nation States left behind 6 scientific instruments on the moon called retro-reflectors. Essentially, these reflectors continue to allow us to reflect a special light beam we send to the moon. The light has to be very powerful and precise to target where the reflectors are on the moon for it to work. By measuring the time in picoseconds our light takes to make the round trip, we know the distance to the moon in millimeters. From using a retro-reflector, we know the moon’s distance from the earth increases about 2 cm per year. Laser beams are used because they remain tightly focused for large distances. Nevertheless, there is enough dispersion of the beam that it is about 7 kilometers in diameter when it reaches the Moon and 20 kilometers in diameter when it returns to Earth. Because of this very weak signal, electronic, human eye observations are made for several hours at a time. By averaging the signal for this period, the distance to the Moon can be measured to an accuracy of about 3 centimeters . My point is that any energy source in the visible spectrum would have to be very powerful indeed if we wanted to place a sign on the moon like “Eat at Joes” or shine a light on a massive Christian cross for us to see it on the earth. It’s just not practical to generate that kind of power. We could consider building a reflector for visible light and use the sun for energy. I need to work the math but the moon’s soil is not an ideal reflector, having optical properties similar to coal. My intuition is we would need something on the scale of the state of Connecticut for the human eye to know something was there. That “something” would require machines to process the surface, perhaps laying hundreds of square miles of reflective film. Getting equipment to the moon is not trivial. We are just beginning to explore the moon using private funds. A swag at the cost to place a simple lunar rover on the moon and have it last 2 weeks may be on the order of $70 million. Even a hundred of these rovers couldn’t shape the moon’s surface to reflect back a sign like “Drink Coke” from Cocoa Cola” or “Just do it” from Nike. An optical property that allows us to see the man-in-the-moon is sunlight reflecting from contrasting lunar soils: those on the highlands (light) against those in its lunar mares (dark). Many of these have landmasses the size of Texas and Alaska combined! Giant lunar craters like Tycho, Keplar, and Copernicus also provide us visual references to the lunar surface. They also remind us how violent the universe is. So let us take something we CAN see of the moon from earth: the lunar crater Copernicus. From earth, if you have exceptional eyesight, the crater appears as a white dot without a telescope. Copernicus is actually 93 km (58 miles) wide and is 3.8 km (2.4 miles) deep. It has crater rays extending 800 km (497 miles) that help us see it. Now that’s a big tattoo! So what does it mean when we say “Put a cross on the moon”. In its simplest form, the cross could be a logo on a private rover. Escalating from there, we could contract a private company to place a 6 to 8 inch high cross in the lunar surface. By now we know such tokens of our faith would not be seen from earth. Instead, for a brief time, the cross would be seen through the rover’s HD cameras. The perspective would be seeing the cross with our bright blue and white planet in the background, and the stark gray lunar soil in the foreground. Many of us remember the image of an American flag planted in the lunar soil. We cannot raise anything on the moon that could be seen from earth with the naked eye. Our picture of a cross rising hundreds of miles above the lunar surface is an artist’s symbolic interpretation. 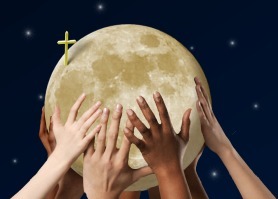 Notice we show many hands lifting the moon as our reference to needing many people to support placing a cross there. Our moon cross will be small. Lunar rovers will be our eyes to see it from earth. Explorers will come later. We will pray for them and they will offer up prayers from the moon. It has been this way since mankind went into the unknown. But this mission, should you accept it, is more than physically placing a small cross on the moon. It is about recognizing His plan when confronted head on with the universe. It is about acknowledging that God loves us and that we need Him in our lives, even as we are overwhelmed by how small we are compared with the universe. We are important to the Creator. Past explorers knew this and carried the Bible to build their personal relationship with Him.They built sanctuaries in remote places and prayed on oceans, continents and mountaintops. Space explorers will be no different. God’s promises to connect with us are timeless. Hopefully you see that we should not limit our reverence for Him when only on this planet.